In 2008, an informational pamphlet was published by NASA to map out the steps for acquiring space shuttle artifacts. With fewerthan a dozen missions remaining before the scheduled retirement of the spaceshuttle next year, NASA has turned its attention to what should become of theorbiters, as well as the millions of shuttle spare parts that will be left overwhen the program ends. For the first time in nearly 40 years since the lasttransition from Apollo to shuttle, the agency is faced with deciding whatshould be saved as artifacts for posterity. Rendezvous, a quarterly magazine published toprovide NASA employees with the latest transition news, recently addressed the issue ofshuttle artifacts by interviewing Rich Wickman, transition manager forInfrastructure, and Lindy Fortenberry, shuttle program artifacts lead, as wellas Valerie Neal, curator of the space shuttle collection at the National Airand Space Museum in Washington, DC. Thefollowing originally appeared in the Winter 2009 issue of Rendezvous asreleased by NASA. What'san artifact and who decides? Normally,we think of artifacts as objects from bygone eras that give us a window intowhat life was like in the past. We think of crumbling ruins, dusty relics fromancient tombs, shards of pottery and yellowed leaves of parchment. But what isan artifact, exactly? And who decides what's an artifact or not? To NASA andthe institutions interested in preserving the legacy ofthe Space Shuttle Program, artifacts are the items that best capture thehuman or technological achievements of the United States human spaceflightprogram. They are things that teach and inspire. And they are the"firsts." The task offiguring out what should be considered an artifact is shared by a large team ofpeople from NASA's Office of Infrastructure, the Office of Public Affairs, theSpace Shuttle Program and center institutional offices, plus representativesfrom almost all the aspects of program logistics and flight operations. Andit's also the people -- educators, historians and visionaries from the nation'stop air and space museums -- who care about preserving the legacy of ourspacefaring achievements so it can be presented to a wide-eyed audience. 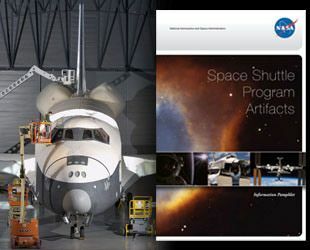 In 2008, aninformational pamphlet titled "Space Shuttle Program Artifacts"was madeavailable by NASA to help answer key questions and map out next stepsfor institutions interested in acquiring shuttle artifacts. In it, NASA definedthe term "Space Shuttle-Related Artifact" as "those items havingsignificance to the history of human spaceflight in the space shuttleera." In late2008, NASAissued a formal Request for Information -- or RFI -- to obtain inputfrom "educational institutions, science museums and other appropriateorganizations with experience in public display of space hardware andnationally recognized historical artifacts." In addition to determiningwhich entities could bear the cost, including preparation, transportation andthe provision of an appropriate venue for display, the RFI sought to establishhow these artifacts could best be used to inspire American students and thepublic at large. FromWickman and Fortenberry's perspective, the challenge often seems daunting.There are, after all, more than 1.2 million line items to be excessed,including the elephants-in-the-room: the orbiters and their main engines (flownand not flown). In fact, of those 1.2 million items it was those few iconicitems that made the RFI necessary. "Inthe August timeframe, we were getting a better handle on the transition andretirement budget," Wickman said. "It became clear that the budgetwould not allow NASA to bear the cost of preparing three orbiters for publicdisplay. So the thought was put on the table that we should use the RFI as anopportunity to see what organizations out there might be able to help offsetthe costs of transferring an orbiter to their organization." Unfortunately,by the time it made it into thenews, offsetting the costs had been translated by reporters as putting theshuttle on the auction block -- something NASA has no intention of doing. "We'renot selling the shuttle," Wickman explained. "We intend to donatethem to eligible organizations. But we will be asking those organizations topick up the cost of moving the orbiters and making them safe for publicdisplay." Wickmanwent on to make the point that the orbiters are $2 billion machines, so sellingthem for what they are worth would be pretty hard to do. Not to mention thefact that, since all NASA property belongs to the United States taxpayer, NASAmust follow federal property disposal regulations, which allow eligibleorganizations to request that property be donated to them before it is offeredfor public sale. And thoughthey may seem a bargain compared to the price of a shuttle, the costs forsafing and moving the orbiters are significant. Wickman offered a roughestimate of $42 million dollars per orbiter, which would include about $6million in ferrying cost with the remainder divvied up among safing operationsand preparations for display. Continue reading "SavingThe Space Shuttle, Piece By Piece" at collectSPACE.com.